Pony camp in a box! 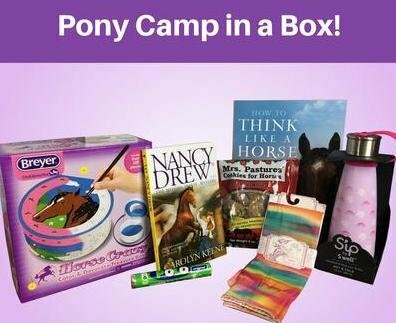 This monthly subscription box is like pony camp in a box! Delivered monthly to horse-crazed girls, it's packed with fun items for the pony dreamer, occasional rider & current horse owner. I was impressed by the variety of items in the box, and was really happy to see one of my favorite horse books included in the box I reviewed. I feel like it has a little something for everyone and I know I would have absolutely loved getting a Pony Xpress Club box when I was younger. Who doesn't love a horse-themed surprise? Plus, I love the fact that it was created by Julie, a horse crazy girl, for girls who love horses. When your friends or family want to know what to get you, send them to the Pony Xpress Club website for Pony Xpress Club! FYI: Pony Xpress did not pay me for this video or review. They sent me a box to demo and one to donate to a lucky winner in our competition. I am donating the contents of this box to a toy drive. I am so excited to find your site. As a kid we always had horses & now I am introducing my 7 yr. old granddaughter to riding. She loves horses & wants to be a vet when she grows up. Very kind of you to donate. I'm already a follower of this brand, and it was nice to see the contents of the box. What a great thing for horse lovers! This is such a great thing to get my daughter who is obsessed with horses. Thanks for sharing this with me. Cool! This would be a great present for my little sister. This will be a perfect holiday gift! Awesome! I love Phantom Stallion books and the paint horse looks like so much fun! What a neat idea!! I love how there is such a wide range of products in the box. Thanks for sharing!